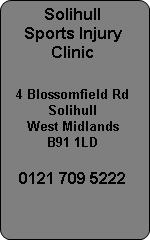 Solihull Sports Injury Clinic physiotherapists and osteopaths offer an alternative to Solihull Chiropractors for neck pain treatment in Solihull West Midlands. Stiff necks can be treated successfully with a variety of treatment options such as mobilisation, manipulation, soft tissue massage, electrotherapy, stretching and strengthening. Neck pain or neck injury from a whiplash road traffic accident is very common. Often the ligaments are damaged and require physiotherapy and careful rehabilitation to reduce pain and restore range of movement. Our Solihull Physiotherapists at Solihull Sports Injury Clinic treat sports related neck injuries but also arthritic conditions which cause neck pain. Neck collars are sometimes used to ease pain during treatment. Neck pain may involve trapped nerves and our osteopaths are at hand to diagnose and treat nerve related neck pain.